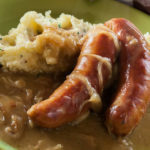 Bangers and Mash is a popular recipe that originated in Britain and has become wildly popular in Ireland and the United Kingdom. This dish is made up of cooked sausage (Bangers) served with Mashed Potatoes (Mash). And most often it is served with a thick onion gravy coating the entire dish. Bangers and Mash served with onion gravy. And for those that would like to add an additional side dish, it is typically served with a side of peas. But where did the term Bangers and Mash come from? It is thought that the term originated around the time of World War I. Because there was a huge meat shortage, sausages were often pumped with various fillers, including water. Once they were put in a pot to cook, they would explode, causing a loud ‘banging’ noise as they were thrown against the side of the pot. And of course, the ‘mash’ is a simple abbreviation for mashed potatoes. Sausage (Bangers) cooking in the pot. 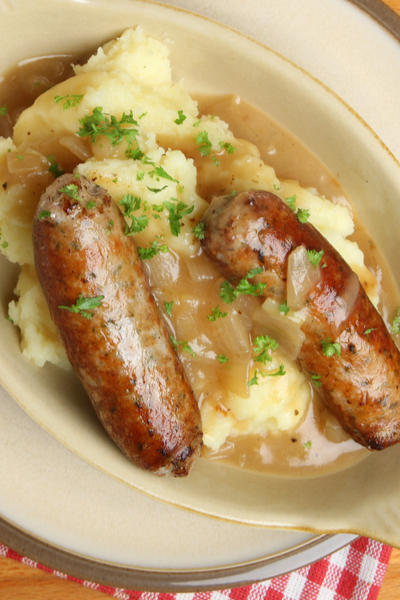 Bangers and Mash have come a long way since World War I. There is no longer a shortage of meat and this dish is wildly served across pubs and restaurants throughout the U.K. 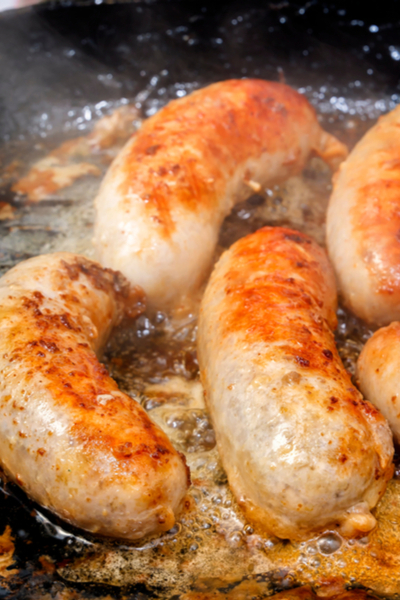 The sausages that are used now are made with a high quality pork or beef and easily cook without exploding. The type of sausage that you use in this recipe is totally up to you. With hundreds of different varieties available, each chef has their own preference. Some prefer to use 100 percent beef or pork. And others prefer to use sausage that have been made with a combination of beef and pork. You can use any type of sausage that you prefer. Although there are sausage made from lamb, chicken and other meats, these tend to be less popular than the traditional varieties. Once you determine what type of meat to use, the next step is to figure out what spices that you like in your sausage. There are some flavored with savory spices, and some that have a sweeter taste. 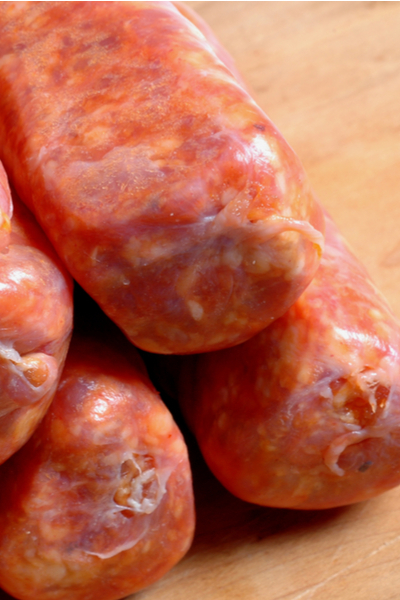 Our personal preference is to use a spicy sausage made with a combination of beef and pork. 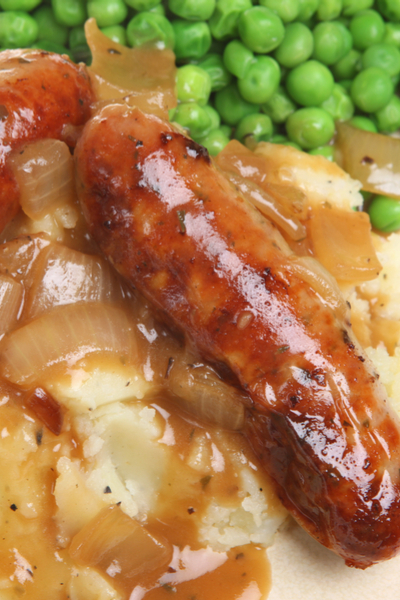 Bangers and Mash is historically served with a thick onion gravy. Onion and beef broth cooking down into a thick gravy. 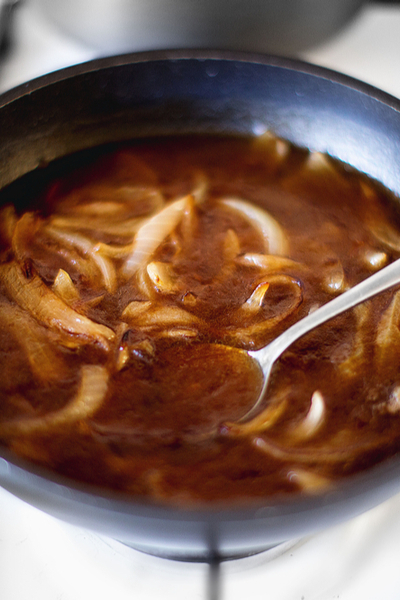 It is important to allow the onions to saute until golden brown before adding the stock. The cooking process of the onions will cease once the stock is added. And speaking of stock, be sure to use beef stock for the best results. Beef stock has a deeper and more rich flavor than chicken or vegetable stock. Of course, if all you have is chicken stock, you can certainly use it. However, you will gain so much more flavor when using beef stock. Once the gravy has had time to thicken, place the sausages back in the pot to heat up one final time before serving. Bangers and Mash served with a side of peas. There are two ways that you can plate the sausages. Either on top or alongside of the cooked mashed potatoes. Then pour the onion gravy on top of both the Bangers and Mash. And if you wish, you can add a serving of cooked peas to the plate as well. Sausage and mashed potatoes served with a thick onion gravy that is traditional and economical meal famous in Britain and Ireland. Heat ½ tablespoon of olive oil in a large skillet pan over medium high heat. One hot, add sausages and cook, turning until browned cooked/heated through. Remove sausages and set aside. Turn skillet heat to medium. Add the remaining oil to the skillet. Add onion and cook for 3 minutes. Add the garlic and cook and additional 1-2 minutes or until onions turn golden brown. Add flour and toss with the onions and garlic until absorbed. Add 3/4 cup of beef broth and mix until a thick mixture develops. Pour the remaining beef broth in the skillet and mix until combined. Bring to a simmer and stir frequently until the gravy thickens. Toss the sausages back into the pan and coat with the gravy. Note: the gravy will thicken as it stands. Season with salt and pepper to taste. Serve sausages and gravy with mashed potatoes.